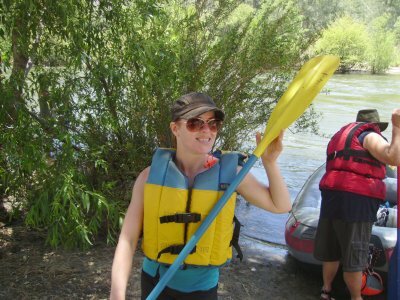 I was determined to raft at least once this year, before the water level dipped to pinball levels. On Wednesday, we didn’t have enough people to make the trip; on Friday everyone was calling me wanting to go. The crew this trip consisted of Instructor John, Darnell, me and first timers for this group – James, Haylee and Ulli. 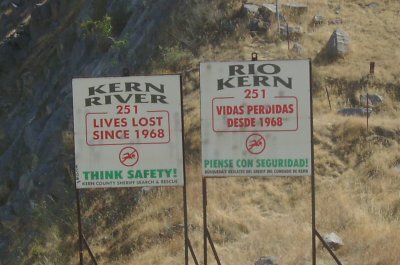 The Kern River death count is now at 251. We were on the river at noon. The water level was still running decent, but down from previous weekends. … Instructor John, Me, James, Haylee and Ulli. 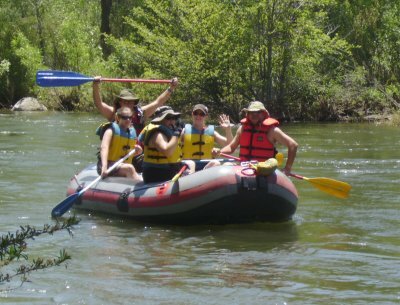 The raft remained in control; everyone paid attention to the commands. Lots of pits and hay stacks, especially over the Powerhouse rapids. There was a photographer at the Ewing rapids, but as we found out later, they didn’t take any pictures of us the whole day. 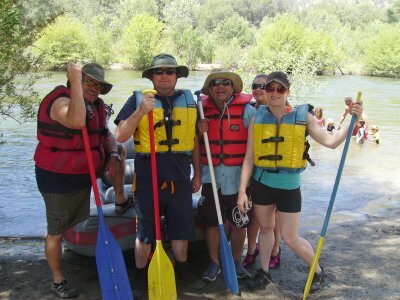 …Ulli, Instructor John, Darnell, James and Haylee. I sat out the second run and drove the van back down hill. This is Ulli from East Germany – an absolutely fascinating and entertaining woman who slightly remembers how badly communism sucked. To make Ulli feel safe, I wore my German Police shirt. We ended up making two more runs; each run was about 30 minutes down four miles of river. It seemed like half the rafters going down the Ewing rapids wiped out; we didn’t. 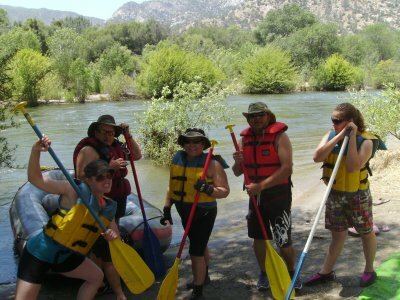 This was a perfect trip – everyone showed up and on time, traffic there and back was light, nobody fell out of the raft and everyone did their share of what had to be done. We’re not sure when the next trip will be, but it may not be until next year.